Quite a number of Asian students have problems distinguishing between the /r/ sound and the /l/ sound. Essentially this is because the difference in these sounds does not exist in their mother tongues‏‎ and so they are unable to “hear” the difference. i.e. they sound the same. This simple tip will help to show your students how to make the two different sounds by forming their mouths into different shapes. It begins with you demonstrating this to your class; you might also want to show a picture to make things extra clear. 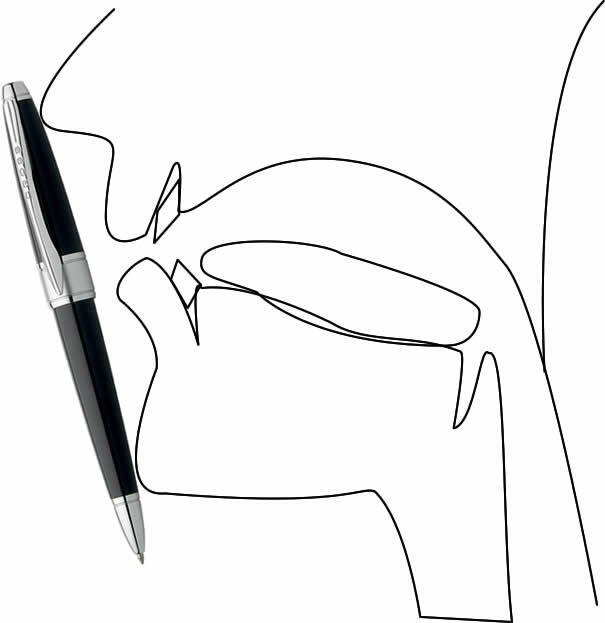 Hold a pen against the tip of your nose and the edge of your chin. To say the word red and notice how both of your lips touch the pen at the beginning and your tongue is well back in the mouth. Now keep the pen there and say the word led. This time your lips should not touch the pen and the tongue begins well forward in the mouth. ICAL Personal Tutor Ron Bradley, shares his technique for teaching the pronunciation of the American /r/ to Japanese students, a sound that clearly is not in the repertoire of the Japanese sound system. I have experimented with the /l/ and /r/ sounds when teaching Honda executives in Japan, and with some success. I began with production rather than discrimination, that of getting the students to physically produce the American /r/ in initial position. My students were quite surprised when they heard the results and then, for at least a short time, being able to clearly reproduce it. I simply had them say /u/, as in ‘you’, hold the rounded lip position, forcing the tongue toward the back of the mouth and saying “red”, and then slowly reflexing the tip of their tongue, as in /ured/. With the tongue forced back, they could no longer reach the alveolar ridge. If they managed to keep their mouth rounded (and that was a trick, as they seemed to have a reflex action to suddenly smile) they would produce the correct reflexed /r/. I can remember one female Japanese student just light up when she heard herself saying the “perfect” reflex /r/ sound!